There’s a collection tin in the Village Shop. You can transfer funds directly into our bank account. Our Just Giving on-line donation page has now timed out. We raised £865 toward the target. You can see who donated here. 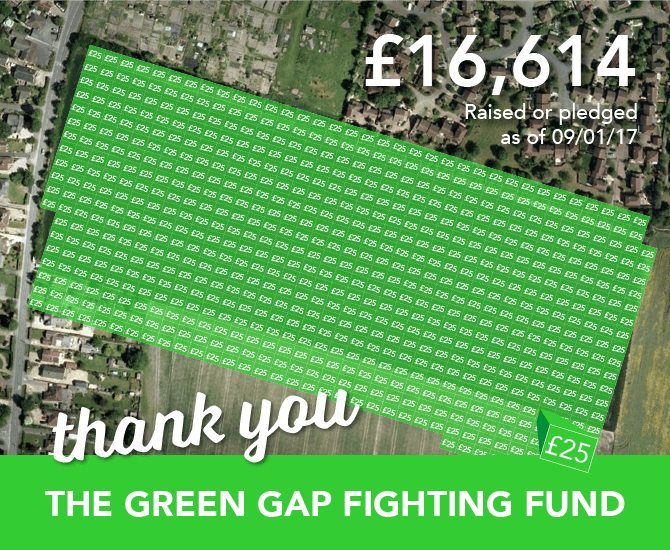 We need your help to keep the Green Gap green. We’re looking to raise money to help us fight Grainger’s appeal against the unanimous refusal of their application by SODC. Mind the Green Gap we will have the chance use the evidence of expert witnesses in the appeal. Their testimony will add weight and credibility to our position. We have identified landscape/visual impact and traffic/road safety as two critical areas – very likely there will be more. We estimate that employing expert witnesses will cost approximately £5,000. Prior to the Planning Committee meeting we received advice and support from one the UK’s most respected planning lawyers. We plan to retain them for this next stage. This will cost in the region of £4,000. Posters, leaflets, printing documents etc are unavoidable expenses. It’s important that we communicate our position and rally support effectively. We estimate £2,000 for these items. We also feel it would be wise to have a contingency budget. We’ve allowed £1,500 for this. East Hagbourne Parish Council has pledged up to £5,000 to the Fighting Fund. This will cover the cost of our planning lawyer. Fundraising Events. Our first one is the MtGG Quiz Night and Auction. This will be on Monday 17th October at the Fleur. Put the date in your diary. And thanks to Darren and Ruth for supporting us. Donations. You can donate via our Just Giving Page, send a cheque; transfer money into the MTGG bank account; or put money in the box at the Village Shop. There are two ways we can make our case at the appeal hearing. We can present it ourselves or employ a barrister to present on our behalf. There are pros and cons to both approaches and we will continue to discuss and seek advice about this issue. Should we go the barrister route we may need to seek additional funds further down the line. Possibly an additional £8,000 to £10,000. Who’ll look after the money? Mind the Green Gap has opened a bank account with HSBC. All monies raised and spent will be audited by our very own financial officer Colin Millar. We will regularly post up on the website how much we have raised and how. What happens if we raise more too much? In the unlikely event that we raise more money than we need we will discuss with the community what should happen to it. Together we may decide to keep some up our sleeves to fight future speculative developments. Or we may decide to donate the funds to local charitable causes in both Didcot and East Hagbourne.